Join us next weekend at the 23rd Annual Washington Koi & Water Garden Koi Show… September 6th and 7th at Country VIllage in Bothell Washington. Stop by to check out the beautiful koi on display and visit us at our booth where we will have some beautiful Sakai Gosanke on sale! This entry was posted in Uncategorized on August 30, 2014 by koiadmin. Admission is Free! – Parking is Free! – Registration is Free! By popular demand, Pan Intercorp will be holding a second koi auction this year. Among the koi scheduled for auction are examples from renowned breeders like Sakai, Omosako, Marusei, Marusaka and many others. Mark your calendar and hold the date for this fun and educational event! 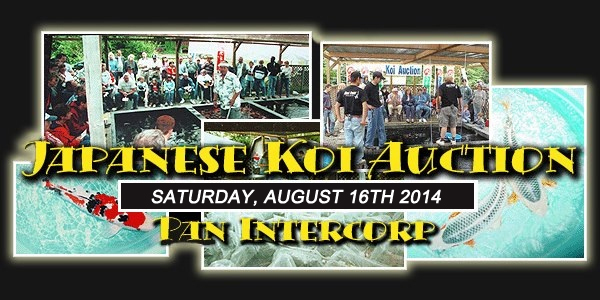 Pan Intercorp will also be accepting over the phone bidding on select koi. If you are planning on bidding using this method, you must have your bids place on or before Friday 8/15/2014. Going once, going twice, three times…SOLD! By popular demand, Pan Intercorp will be holding a second koi auction this year. This entry was posted in Uncategorized on August 2, 2014 by koiadmin.